It is no secret that the vintage Rolex market is booming these days. Old school Rolex watches that once retailed for a few hundred dollars are now fetching well into five-figures; some even regularly crossing the six-figure mark. But how about modern Rolex watches? Which ones will be collectible classics in a few decades time? In our new Modern Rolex, Future Classics series, we will be selecting modern Rolex watches made in this millennium and highlighting why we think they will be future classics. And we kick things off with the Rolex GMT-Master ref. 116710BLNR. 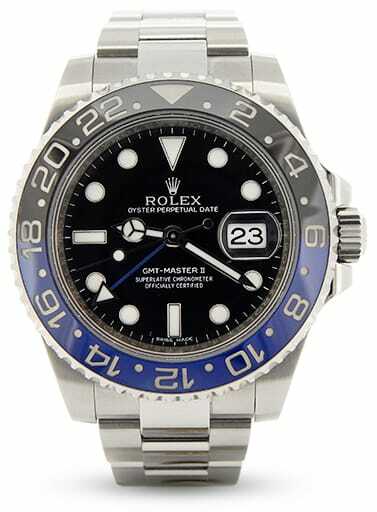 The Rolex GMT-Master II 116710BLNR is a young watch. Rolex introduced it at Baselworld 2013 and it is still part of Rolex’s current lineup. This is a modern version of Rolex’s pilot watch, built to display two time zones simultaneously (and indicate a third via turning the bezel), as well as the date. Design wise, the 116710BLNR sports a 40 mm Oyster case in stainless steel and it is fitted with a stainless steel Oyster bracelet. Housed inside the case is a black dial with the familiar Mercedes-style hour and minute hands. As a GMT watch, the ref. 116710BLNR also has the characteristic 24-hour hand (in this case, a blue one) with a large arrow tip to read a second time zone off the 24-hour marked bezel. The lume-filled hour markers and hands are fashioned in 18k white gold to prevent tarnishing. Finally, on the dial is also the ubiquitous date window at 3 o’clock. Protecting the face of the watch is a scratch-resistant sapphire crystal, complete with a Cyclops magnification lens on top of the date. The defining feature of the watch is its Cerachrom ceramic bezel, which is half blue and half black. Fun fact, “BLNR” at the end of the reference number stands for Bleu (French for blue) and Noir (French for black). This particular color scheme has led to the watch’s popular nickname: the “Rolex Batman.” Like all GMT-Master II watches, the bezel is bi-directional, allowing the user to turn it both ways. Underneath the solid screw-down caseback of the GMT-Master II ref. 116710BLNR is the in-house Rolex Caliber 3186 automatic movement with a 48-hour power reserve. To ensure its 100-meter water resistance, the Rolex 116710BLNR is fitted with a Triplock screw-down winding crown. Why Will The Modern Rolex GMT-Master II 116710BLNR Be A Future Classic? So why do we think the GMT-Master II ref. 116710BLNR will be a future classic with high collectability? There are a few reasons. First, the Rolex Batman was the first Rolex watch to have a bi-colored bezel in Cerachrom ceramic. As many of you may already know, when Rolex launched the first GMT-Master watch in the 1950s, one of its signature design details was its bi-colored red and blue bezel. The combination of the two colors was not just done for aesthetic reasons but it was a way to differentiate between daylight hours and nighttime hours in the second time zone. Since then, two-tone bezels have become iconic within the GMT-Master collection. However, when Rolex released the very first watch with a Cerachrom ceramic bezel (yellow gold GMT-Master II ref. 116718 with a monochromatic black bezel in 2005), the company stated that it would be impossible to make a bi-colored bezel in this material. But they did, in fact, manage to manufacture a dual colored ceramic bezel and debuted it on the Rolex GMT-Master II 116710BLNR. This detail makes the BLNR a significant reference in Rolex’s modern history. Another reason that it is likely that the GMT-Master II ref. 116710BLNR will be a future classic is the speculation that Rolex will phase it out quite soon. As you will remember, Rolex released three new GMT-Master II watches at Baselworld 2018. These new generation GMT-Master II models are all equipped with the new Caliber 3285, boasting an amped up power reserve of 70 hours. So, it would make sense if Rolex replaced the current GMT-Master II 116710BLNR with a new-gen reference in the very near future. And if that were the case, then the ref. 116710BLNR would have been in production for a relatively short time, which heightens the collectability of the model in the future. It is also worth mentioning that the GMT-Master II ref. 116710BLNR is one of Rolex’s most sought-after models right now, selling over retail in the secondary market. So that desirability will only be amplified once the model is discontinued. Remember, this is all merely speculation; no one can know for certain what the market will be like in the future. However, using historical information and current market trends as a guide, the future certainly looks bright for the Rolex GMT-Master II ref. 116710BLNR.